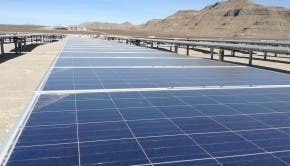 The Berkshire Hathaway Energy subsidiary BHE Renewables has purchased a 66 megawatt (MW) solar garden portfolio from Geronimo Energy, according to recent reports. This brings the BHE Renewables solar garden portfolio up to 100 MW — as the Warren Buffett owned company had already purchased a 34 MW solar garden portfolio from Geronimo Energy. The new purchase — which was of the “Minnesota Community Solar Garden developments” portfolio — relates to solar garden capacity spread across 16 different counties, in 21 different specific locations. The solar gardens are all expected to be built by the end of 2017. For some background here — “solar gardens” are community-utilized solar installations for grid-connected subscribers. This gives those who wish to go solar but don’t have their own roof space the opportunity to do so.